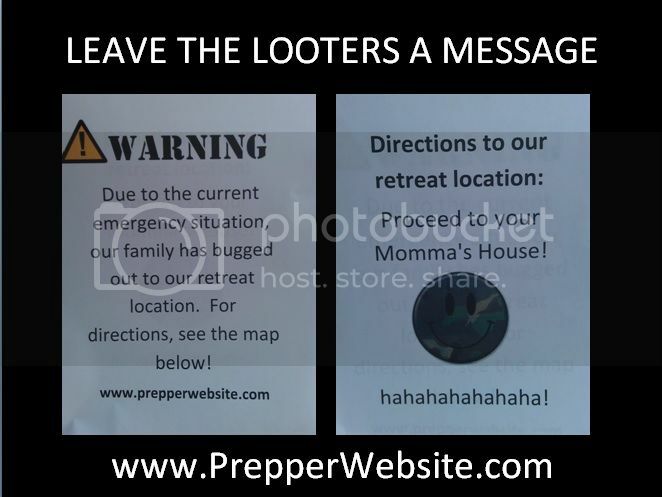 Leave the Looters a Message! BOB’s – Get It Right From the Beginning! The Bugout Formula – If You Have to Ask Yourself, It’s Already Too Late! Conflicted – Live On Air & Uncensored! You are in RANGE and the hogs and dogs are hungry. My sign reads, IF YOU CAN READ THIS SIGN, YOUR IN MY SIGHTS. Congratulations! You have been exposed to small pox and can expect 24 more pain-free hours. Oh man…that would be scary! Now! That is a good sight…But, other version substitute “lethal N7H9 bird flu” OR “lethal Corona virus”. Trespassers will be shot!…And Eaten! looters of all kinds for daily fire practice sessions. Nothing Inside is Worth Dying For.